LEWISTON – Internal emails leaked from the Ben Chin for Mayor campaign show that Ben Chin, who is running to be Mayor of Lewiston in the December 12th Mayoral election has on more than one occasion referred to voters in Lewiston as racists. Email messages leaked to Maine Examiner show a candidate regularly talking about race, referring to the skin color or race of voters and several times calling voters “racists”, “racist”, or saying that he is “dodging racism” while working in the city or referring to “lots of other racist stuff” he heard during his day. Other leaked emails show a candidate who seems to comment on the skin color of voters he talks to consistently. Chin frequently includes in his email comments about how his list for a day was “pretty white, but some African Americans” for example, when referring to a neighborhood he visited, or referring to voters by their skin color when he relays a conversation he had with that voter to his campaign team in his daily emails. 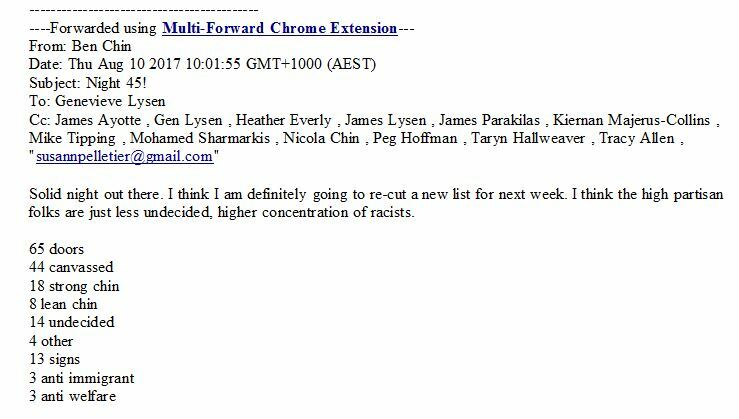 Below is a screenshot of the “higher concentration of racists” email Chin sent on August 10, 2017 to his campaign team. Email sent by Ben Chin to his inner campaign team on August 10, 2017. Ben Chin is running to be Mayor of Lewiston, Maine. The election is December 12, 2017. Photo from Ben Chin’s website. comments and interactions with people based on the color of their skin. Chin, the political director of the liberal Maine People’s Alliance and a lobbyist in Augusta, is making his second run for Mayor of Lewiston. He faces off against Lewiston native and small business owner Shane Bouchard in the December 12 election. Maine Examiner has previously published one email from Chin in which he referred to a group of voters he had met one day as a “bunch of racists too…” Because some of the additional leaked emails Maine Examiner has acquired contain conversations about private individuals Chin has met or spoken to on the campaign trail, Maine Examiner has decided not to publish screenshots of all the emails. The emails, leaked to Maine Examiner from a Chin campaign insider concerned about the direction of the campaign, were examined for authenticity before publication. Maine Examiner may publish additional emails upon further review.